IC Insights has forecasted the total sales of microprocessor chips in year 2013 to increase by 8% to reach $61.0 billion. The growth is mainly driven by demand in processor chips for tablet computers and smartphones. There is no great demand for processor chips in personal computers and notebook computers. The x86 microprocessors supplied by Intel and Advanced Micro Devices to hold a share of 56% of total microprocessor units sold in 2013, a drop of 2% compared to year 2012. 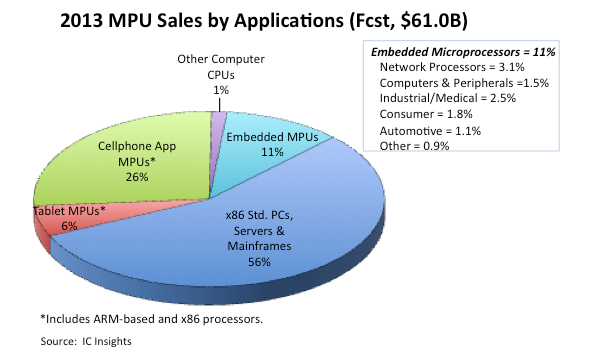 The figure below shows embedded microprocessors are now expected to account for 11% of MPU sales in 2013 (versus 9% previously), while tablet processors are projected to be 6% of the total (compared to 5% in the original January forecast), according to IC Insights. The new forecast by IC Insights keeps cellphone application processors at 26% of total MPU sales in 2013 but lowers the market share of non-x86 central processing units (CPUs) in computers outside of tablets to 1% (from 2% previously). The processor IP vendor ARM's market share growth continue to rise in the processor market, particularly in the tablet and cell phone domain. The new mid-year forecast from IC insight has rised tablet processor sales in 2013 to nearly $3.5 billion, which is a 54% increase from $2.3 billion in 2012. Cellphone application processor sales are estimated by IC Insights to grow by 30% in 2013 to $16.1 billion from $12.4 billion in 2012. At the start of this year, sales of mobile processors in tablet computers and cellphones were forecasted by IC Insights to grow 50% and 28%, respectively. The mid-year forecast by IC Insights finds sales of MPUs in PCs, servers, large computers, and embedded applications slipping by 1% to $41.4 billion in 2013 from $41.9 billion in 2012, when revenues dropped 6%. IC Insights says this large MPU market segment was previously forecast to rebound with sales increasing 5%, but the anticipated bounce back has been blocked by weak shipments of standard PCs, which IC Insights believes will fall by 5% in 2013 to 327 million systems. IC Insights projects shipment growth rate of 10% this year from a projection of 9% further processors used in PCs. IC insights finds the total MPU shipments are now expected to reach 2.15 billion devices in 2013, with tablet processors growing 62% to 190 million units and cellphone application processors increasing 11% to 1.50 billion this year. IC Insights’ microprocessor category does not include cellular radio-frequency baseband processors or stand-alone graphics processing units (GPUs), which are counted in the special-purpose logic/MPR category of the IC market.